Opener Luis Reece is confident he will be able to make the step up as Lancashire prepare to return to the top division of the County Championship. The 23-year-old left-hander made his Championship debut last June and averaged 55.53 in 10 appearances as the Red Rose lifted the Division Two title. "I've prepared as well as I possibly can during the winter and hopefully that transfers to the pitch," he said. 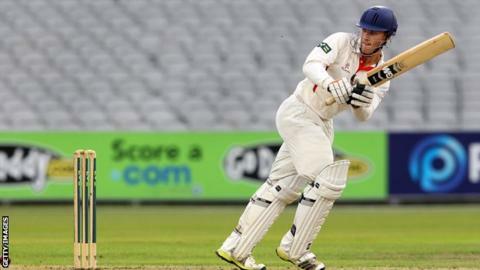 Lancashire begin the season on Sunday with an away game at Nottinghamshire. Reece scored eight half-centuries in an impressive first Championship season, seven of them coming in consecutive innings, but he acknowledges that the standard of opposition will be higher in 2014. "The quality will obviously be better because the better players are in Division One," he told BBC Radio Lancashire. "The fundamentals are the same - you've got to do your basics well and make sure you're in the right frame of mind. "As a cricketer, you look to play at the highest level you can. For me, it's another stepping stone from Division Two to Division One. I'm hoping the preparation I've done will help me to combat that. "Nottinghamshire are going to have a quality bowling attack in the first game of the season, but I back myself to do as well as I can. I know our boys will be ready for the challenge." Paul Horton is expected to open the batting alongside Reece at Trent Bridge and will begin the season as Lancashire's vice-captain. The 31-year-old led the side in the absence of 40-year-old seamer Glen Chapple in the final Championship match of 2013 at Kent. "I'm honoured to be given the role," said Australia-born Horton. "Not a lot changes as far as I'm concerned. Glen is the captain and leads us, and I have an official title to help out, but I was a senior member of the squad anyway and I helped out the same. "We all know that when Glen finishes, there will be an opportunity for someone to lead this club. We might bring someone in, it might be myself or someone like Steven Croft. "I suppose that being vice-captain is a pathway to it, but I still have to perform and score runs. If it happens, then great, and I'll cross that bridge if it ever arises."